In the summer of 1964, Beatlemania was in full force and The Beatles’ movie, A Hard Day’s Night, was in theaters on both sides of the Atlantic. Frantically trying to cash in on the pop phenomenon and not get left behind, three record companies released very similar albums of material from the Fab Four that summer, with the latecomer being Capitol Records’ Something New on July 20, 1964. This infuriating practice of simultaneous issues of similar material in different packages by two or more record companies was S.O.P. in the US and UK in the mid-60s. Market and business differences dictated separate releases, which meant all consumers - from regular fans and serious collectors - were forced to double- or triple-up to enjoy the full menu of most top-level bands. With the Beatles catalogue, it finally stopped with Sgt. Pepper’s, the first Fab Four LP to hit the streets everywhere on the same day and with the same material and packaging. 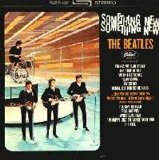 Something New is a great album and a must for any serious Beatle fan. If you can’t buy all three mid-1964 releases, this is the one to own. It’s available for purchase as a CD or individual mp3 files on Amazon, but is not currently on iTunes. The Beatles have two sets in Dr. Rock’s Playlist Vault.